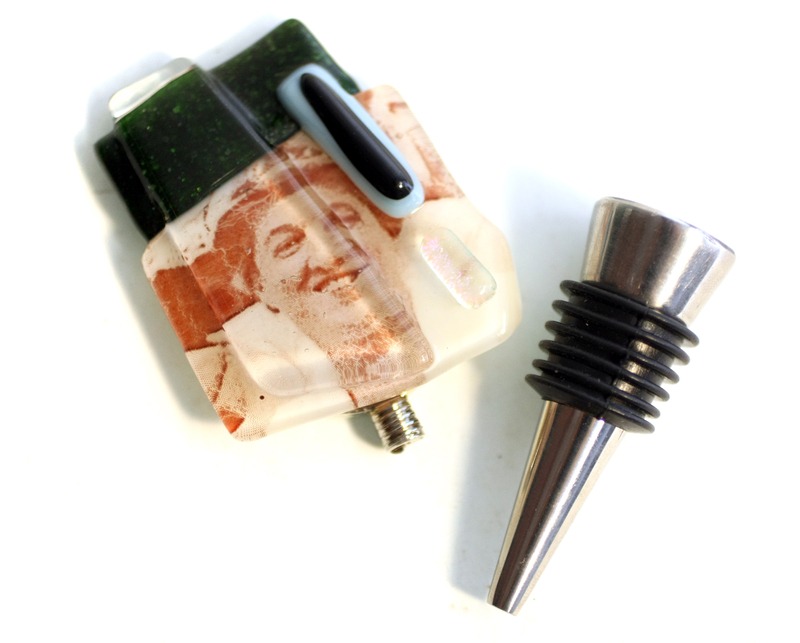 Featured Item: The “Smilin’ Gal” Wine Bottle Stopper! This piece in particular is great because of the interesting process involved with fusing the imagery into the glass. Artisan Troy Moody prints his images in a toner heavy in iron content. When the glass and paper hit the kiln, all of the paper fibers burn away to leave the glass AND the iron from the toner embedded within. (That’s why the image is a sepia tone!) 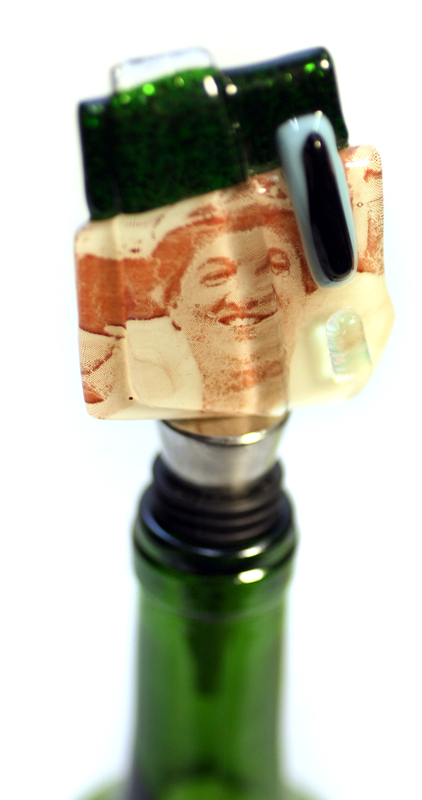 And what better image for a wine stopper than someone that looks like they’re having a really good time? *accompanied by a favorite bottle of vino o’ course. Posted on January 29, 2015 January 29, 2015 Categories Featured ItemTags anniversary, az, bottle stopper, connoisseur, craft, functional art, fused glass, gift, host, hostess, house warming, phoenix, Practical Art, retro, sommelier, troy moody, valentines, vintage, wedding, wine, wine stopperLeave a comment on Featured Item: The “Smilin’ Gal” Wine Bottle Stopper! Announcing the New Artisans of Summer ’14! Maybe you’re a snowbird, or maybe you just don’t venture out during the heatiest of the heat, so you may have missed a bit this summer at the shop… and by a bit, I mean A LOT! This summer saw Practical Art’s representation expand to include almost a dozen new artisans. Check ’em out! Gene is a modern furniture artisan with a penchant for mid-century design. His impeccable craftsmanship and eye for beautiful woods, designs, details, and finish set his work apart. 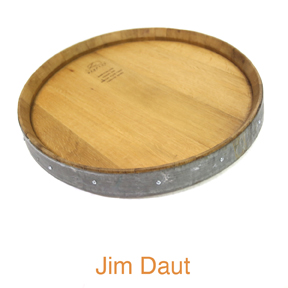 Jim’s work is crafted entirely from old wine barrels– tops and staves! His work at Practical Art includes lazy susans (pictured), bistro tables, candle bridges, and cheese trays. 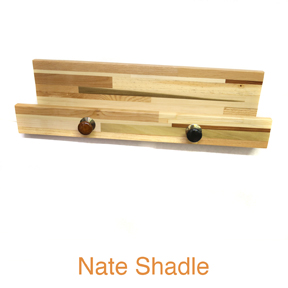 Nate’s wood racks, frames, and mirrors are made entirely of scrap pieces of beautiful woods. A highly-labor intensive process, a 6′ length of wood assemblage can require over a dozen clamps and hours of planning and patience. 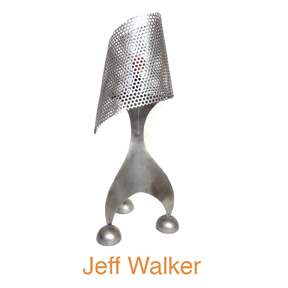 Jeff Walker also refers to his metalwork as Big Time Stuff— and boy is it! Mostly reclamation metals, Jeff’s work takes many functional forms: tables, lamps…even a fire pit! You might recognize Barbara’s name from our summer group exhibition where she displayed her abstract watercolor work, “Global Warming“. She uses the same types of painting process to create wonderfully vibrant jewelry works. 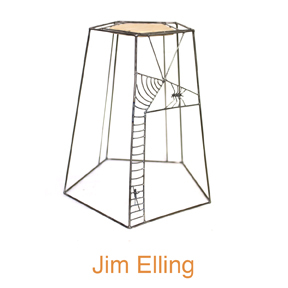 It’s almost like Jim makes 3-D drawings using rolled steel when creating his tables and stools. They’re playful, inventive, and of course, useful! You definitely get a sense of Jim’s personality in these pieces. 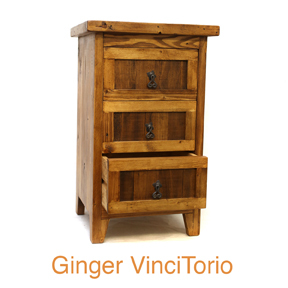 The owner of a Valley favorite Italian restaurant, Vincitorio’s, also designs furniture! It’s utilitarian, chunky, and charming. Ginger loves the details and the accents– be it in the color or the hardware of these nouveau-rustico cabinets and benches. 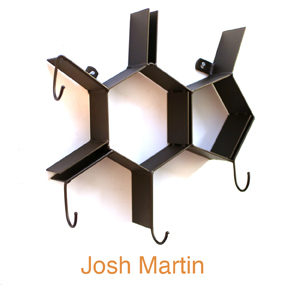 Josh drives home the relationship between art & science with his functional welded steel sculptures depicting the molecular structures of two of our favorite vices– coffee & wine. The wine molecule stores wine bottles, and the caffeine molecule can hold bags of coffee and mugs! You’ll be able to recognize Kathryn’s work by the elaborateness of her sculptural forms– be they lidded vessels or mugs carved with faces of angst. She also has a line of more simple forms for the kitchen, beautiful AND highly useful– garlic keeps and juicers! Elizabeth is offering a selection of high-polish silver jewelry– these babies gleam! Her rings, pendants, and earrings are classy and exactly the sort of thing that goes with a little black dress. Ryan is a renaissance man– builder, photographer, entrepreneur– he’s come aboard at Practical Art to provide us with some pretty creative cutting boards and trivets. The designs are just downright clever, and you may just see some of your favorite vintage pop culture references show up in mahogany, walnut, and maple! Let’s give ’em a warm welcome this Fall! Posted on September 29, 2014 January 3, 2015 Categories EventTags arizona, art, artisans, artists, barbara bagan, ceramic, craft, craft gallery, elizabeth tucker, furniture, gallery, Gene Brown, jeff walker, jewelry, jim daut, jim elling, josh martin, katheryn sins, metal work, metal worker, mid century, mid century modern, nate shadle, phoenix, pottery, Practical Art, retro, Ryan Nelson, steel, vincitorio, vintage, welding, wine, wood, wood workerLeave a comment on Announcing the New Artisans of Summer ’14!